We seem to have the same story to tell every year: somebody got a male and a female at a pet store, gave them a nest box, and then nature took over. This owner was moving and said she could not take her 20 budgies (parakeets) with her. Surprise, there were 25 birds in these cages, 23 of whom were the offspring of the two in the top cage. After we finished examining, trimming, and dividing up all of the birds, we took a look inside the nest box seen in the bottom of the cage on the left. Surprise again, there were four little babies that were only one to two weeks old, bringing the new total to 29. The parents were too freaked out and refused to feed them, so the babies had to be sent to a client of ours to be handfed. Don't give nests to birds, it just encourages egg laying. 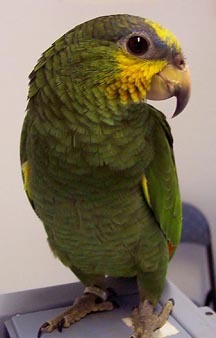 Animal control confiscated two parrots, along with some snakes, turtles and reptiles, from a person who was arrested for other crimes. The KC Pet Project, Kansas City's main animal shelter, brought this Moluccan Cockatoo into our veterinary hospital for an exam. The bird had a leg band with some very distinctive lettering that seemed familiar, so we entered it into our computer. The bird was one that had been stolen from a pet store ten months earlier! We cracked the cold case and got the birds returned to their rightful owners, who had been boarding the birds at the store when the break in occurred. Do you know your bird's band number? If your bird doesn't have a band, have you considered getting him microchipped? These methods are no guarantee that a lost or stolen bird will be returned to you, but at least it can prove that you are the rightful owner. A man called one afternoon to say he needed a home for his macaw. When we informed him that we had a waiting list for taking in big birds, he said that his bird had a bloody wound on the leg, and that he was leaving town that night to move out of state. So Kizzy the Military Macaw came to stay with us, and she turned out to be one of the sweetest birds ever. The wound on her leg and body was huge and required surgery. Over the course of months we did extensive testing, multiple medications, bandages, and collars, and each time she was almost healed she would tear at herself again. Not all of our stories have a happy ending. Kizzy died suddenly of an infection that attacked her liver, but at least she got to live the last few months of her life loved. Pet ducks are adorable, but like young children they don't always make the best decisions. This girl was very sick when she came into the hospital, and X-rays showed several round metal objects in her ventriculus, also known as the gizzard, which is the second part of a bird's stomach. Turns out this sweetheart liked to pick up and swallow coins off of the floor in her house. We tried getting the coins out using long grasping forceps by making a small incision in her crop, but the coins were turned in an awkward direction and could not be grabbed. We had to do surgery and open up her proventriculus, the first part of the stomach, in order to extract the money. He stomach acids had eaten away a lot of the metal, allowing the zinc to get into her bloodstream and making her sick. She responded very well to chelating medications that bind metal in the bloodstream, and was soon up and quacking again. Two days after being attacked by a dog, Max the cockatiel was brought into our office. The owner had used band-aids to hold the wing up since it was dragging on the ground. Since he had not received immediate treatment, the exposed bones were dried out and infected, and there was no choice but to amputate his wing. The owner refused, choosing to take him home with antibiotics and proper bandaging, and wanted to see if it would heal in a few weeks. Of course it did not, so Max was donated to our rescue program. We amputated his wing, and within a couple of weeks he was ready to find a new home. It isn't easy to find someone who wants an older cockatiel with one wing who plucks his feathers, but he stayed with us until just the right person came along. Sherlock got his name because he was running loose on Holmes Road in Kansas City. According to the neighbors, he had escaped when someone in the neighborhood bought a few chickens to slaughter, and he managed to slip past them and survive. One local resident had been feeding him, and with our help the man was able to lure Sherlock with his bowl of food and grab him when he got close enough. It is hard to find a home for a rooster as many cities have laws against them. He lived with us for several weeks in one of our outdoor flight pens during the day, and in a cage in the Wild Bird Room at night. He got so used to being moved back and forth that he allowed us to catch him easily, and enjoyed tickling and petting. We have never had to bathe a bird as many times as this guy. We called him the Greasy Grackle, and he had apparently fallen into the waste grease bin behind a fast food restaurant. The stuff was so thick and gooey that we actually had to use mineral oil to try to loosen it up before later using Dawn dish soap to remove the mineral oil. Nothing ever really got all the goo off of him, and he had to live with one of our volunteers for months until he molted the old contaminated feathers and grew new, clean, undamaged feathers. He never enjoyed our attention and would bite every chance he got. You would think he would be grateful for our efforts to save his life! We aren't always available to run out to a wild bird emergency on short notice, but this one was just five minutes from our office. It took a while to figure out what the heck was going on here! This was a battle between two female Red Tailed Hawks who had started fighting in mid-air and had fallen to the ground locked together. One bird had grabbed the other one with one foot on her enemy's face, and one talon had slid between the eye and the eyelid. The second bird sunk one set of toenails into her opponent's wing, and both refused to let go. We had to lift them with a big towel into a carrier, where they finally decided to release their grips on each other. We transported them to Lakeside Nature Center where they could be treated and released. Barney the Blue and Gold Macaw had a terrible fungal sinus infection. When his owner could no longer afford the frequent medicating and sinus flushes, she signed him over to us. We worked hard to fool him by hiding his medications in every delicious treat we could think of, but he was too smart and somehow knew what we were up too. He was a pretty good sport about taking the medications out of a syringe when nothing else worked. After months of dozens of sinus flushes and hundreds of doses of medications, which would have cost thousands of dollars at any other veterinary clinic, his infection cleared up enough that he was able to start a new life in his new home. This mallard duck became the most famous bird in Kansas City for several weeks in 2014. He was frequently reported in the pond in Loose Park at 54th and Holmes, and Lakeside Nature Center was fielding multiple calls a day about him. Some horrible person had shot him with an arrow, which had somehow pierced his neck but missed any vital structures. We made several attempts to capture him, but unlike the domestic ducks we usually go after, this bird could fly. He and his mate frequented a swimming pool behind an unoccupied house, and we almost managed to trap him by creating a 28 by 28 foot sheet of netting and covering the pool with it. One day our volunteer team met up with the Lakeside volunteers and we started making plans while two different television crews filmed us. One guy who thought he knew best refused to cooperate with the rest of us, put his boat in the water, chased after the duck, and the news crews filmed the duck flying off over the horizon. We don't know what ever happened to this little guy. We do our best, but we just can't save them all.